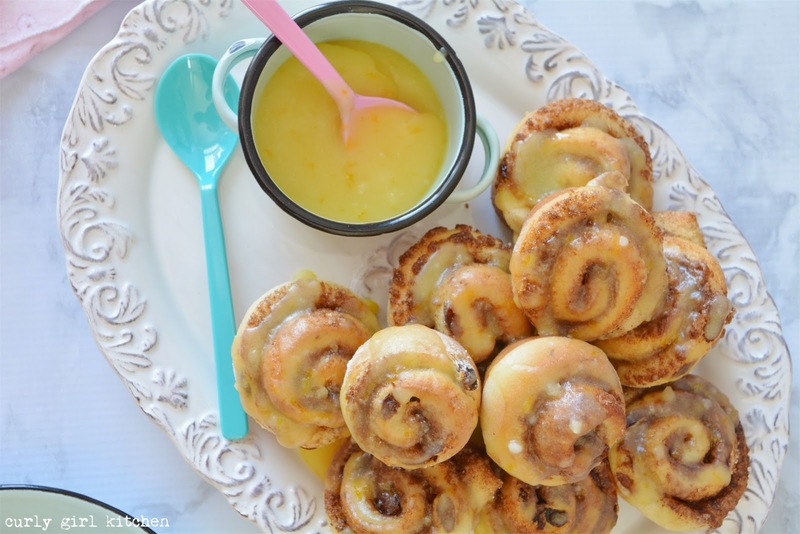 Cinnamon rolls are usually a treat I reserve for the holidays, especially for Christmas morning, but when inspiration for mini cinnamon rolls drizzled with orange glaze took hold, I couldn't help but succumb, even though it's March. The prep time is an hour and a half, which can be an agonizingly long time to wait for the scent of warm cinnamon and sugar to fill your kitchen, but a well-risen cinnamon roll takes time and is worth the wait. 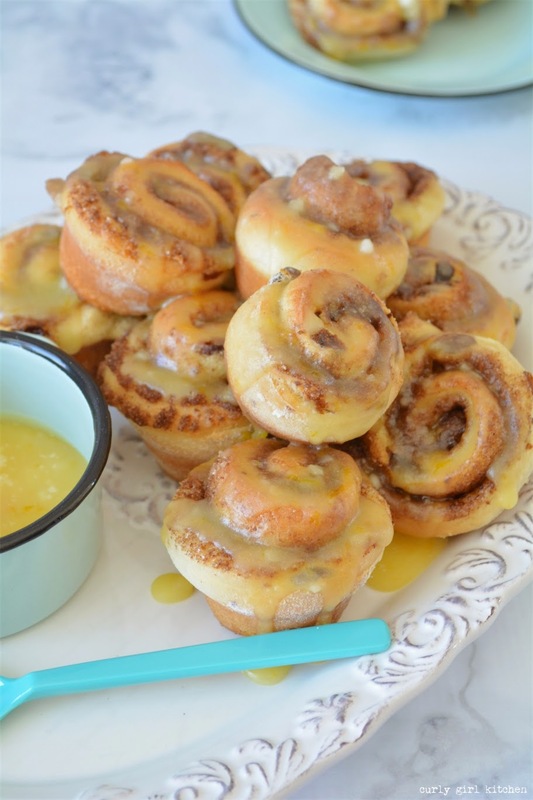 I baked the adorably tiny rolls in my mini muffin pan, which I rarely have occasion to use, and they puffed up so beautifully golden brown, with their amber buttery swirls of cinnamon and sugar tempting a quick taste. 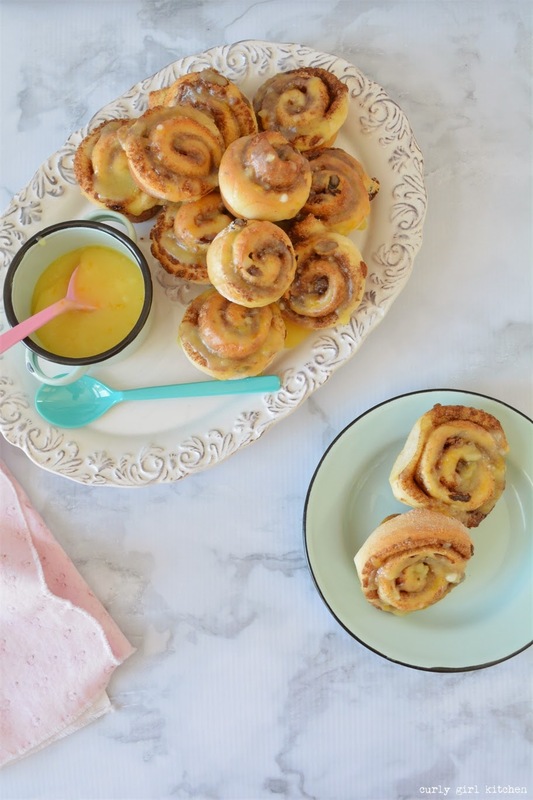 And although you could drizzle some melted butter over top and call it a day, I like finishing cinnamon rolls with a glaze that crusts over. It's the contrast between that sugary glaze and the soft yeasty roll that I love. They looked so pretty, that I couldn't help admiring them for a few minutes, but they're best eaten warm and fresh, so we didn't wait long to taste them. 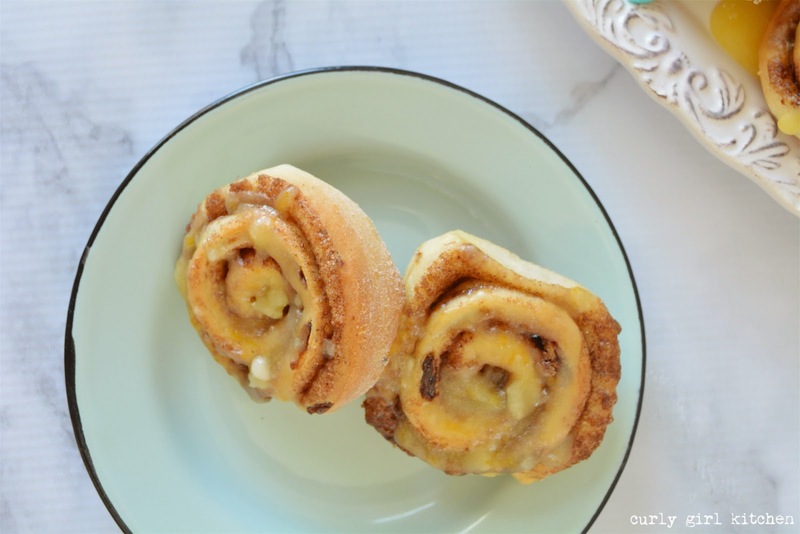 Even a few days later, they were still some of the best cinnamon rolls I've ever had, and softened right up with a few seconds in the microwave. 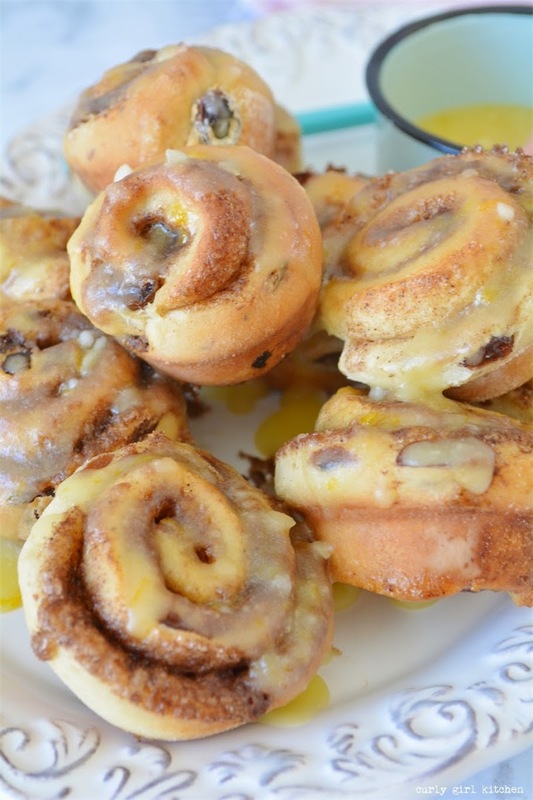 When there were only three left, I tore them up and placed them in a bowl with milk and a beaten egg, letting them soak up the custard for an hour before baking it into a bread pudding, a dessert that Jamie adores. He ate the cinnamon roll bread pudding with a spoonful of caramel on top. Measure the milk into a saucepan or microwaveable dish, add the raisins, and warm to between 110-115 degrees F. Pour into the bowl of your stand mixer. Sprinkle with the sugar and yeast, and let stand for 5 minutes until foamy. Add the remaining ingredients, reserving 1/2 cup of the flour. Mix with the dough hook until combined, then knead on medium speed for 7-8 minutes, gradually adding the remaining 1/2 cup flour, until smooth and the dough pulls away from the bowl. Place in a greased bowl, cover with a towel, and set in a warm place to rise until doubled in size, about an hour. On a lightly floured surface, roll out the dough to 1/4 inch thick, into a long rectangle measuring 24 inches long by 8 inches wide. 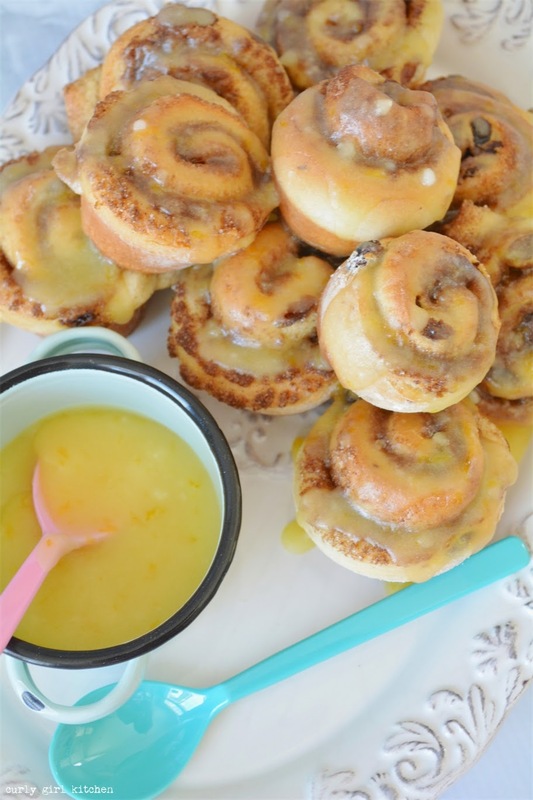 Brush with the melted butter, then sprinkle with the sugars and cinnamon. Roll the dough up to form a log 24 inches long. Use a sharp knife, dipping it in flour as needed, to cut into 24 1-inch rolls. Grease a mini muffin pan (it should have 24 molds) and place the cinnamon rolls cut side up in the pan. Cover with a clean kitchen towel and let rest and rise again for about 30 minutes while you preheat the oven. Preheat the oven to 350. Bake the rolls for 13-15 minutes until golden brown. In a saucepan, whisk together everything except the powdered sugar. Over medium low heat, whisk the mixture to dissolve the sugar. Gradually whisk in the powdered sugar until smooth. 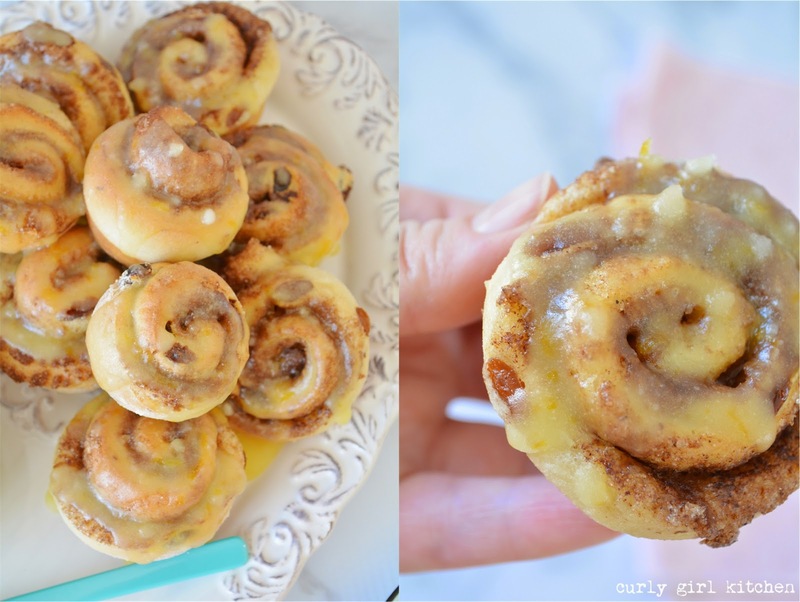 Remove the rolls from the oven. 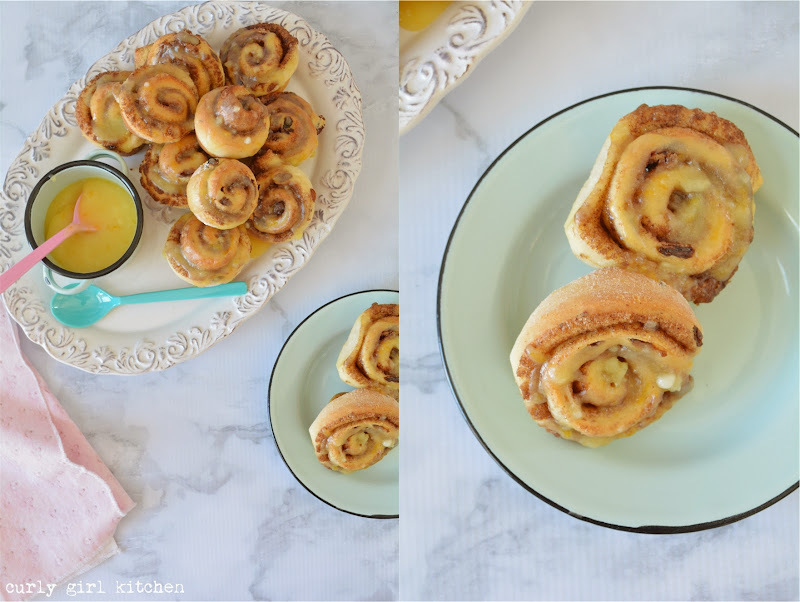 Immediately, drizzle the hot glaze over the hot rolls; the glaze should set in 5-10 minutes.